False photos viral claiming Baba Ramdev met an accident. 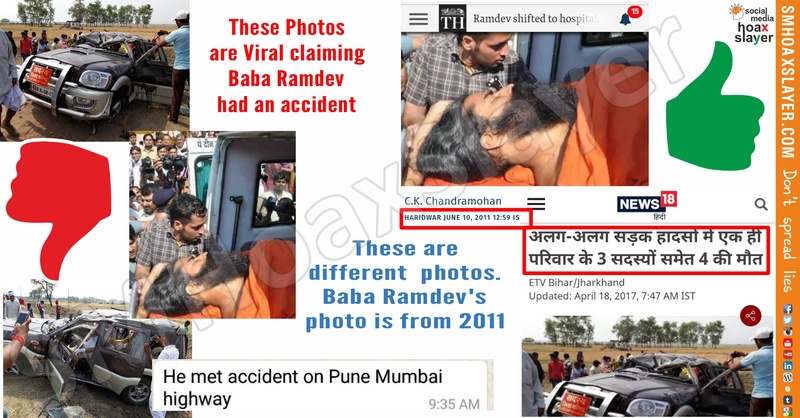 A set of 3 photos is viral on WhatsApp claiming Baba Ramdev met an accident on Mumbai Pune highway. The photo of Baba Ramedv is genuine bit is from year 2011 when he was being shifted to Hospital. The photos of Vehicle is fresh but not related to Baba Ramdev. The condition of yoga guru Ramdev was reported stable after he was shifted from his fast venue at Haridwar to the Himalayan Institute Hospital Trust (HIHT) hospital at Jolly Grant near here on Friday. ‘He is fully conscious, talking and has been administered saline drip to counter dehydration and minor liver ailment. There has been no force-feeding,’ medical superintendent S.L. Jethani told journalists. To a query, Dr. Jethani said Ramdev was conscious when brought to the hospital. The civil administration shifted him from Patanjali Yogpeeth to the hospital after he became semi-conscious around 3 p.m. After examination, the doctors moved him from the ICU to the special ward. The yoga guru’s associate Acharya Balkrishna has also been admitted to the hospital. Art of Living founder Sri Sri Ravi Shankar immediately reached the hospital and was with Ramdev for about half-an-hour. ‘Swami Ramdev has appealed to his followers on fast to take water, lemon and honey. His fast continues and there has been no force-feeding,’ he told journalists, adding that he would take up the matter with the Centre. Uttarakhand Chief Minister Ramesh Pokhriyal Nishank said Ramdev had to be removed to hospital as his condition was deteriorating. ‘He was shifted after discussing the issue with Mr. Balkrishna,’ he said. At Haridwar, Ramdev’s supporters turned emotional and raised slogans against Congress president Sonia Gandhi as he was taken away in an ambulance. ← Do we really need lies to respect our Army ? Don’t we already ? क्या पांच राज्यों मे चुनाव वापस होंगे ? They take even a sarcasm seriously when mind is blind! Mugals’ photo in Congress Office ? Is she really Isha Ambani ? Is that an Ambani Wedding ?